Do you try to persuade your friends to vote for your candidate by sharing political posts on social media and commenting on their posts? We like it when our friends support the same candidate we do, but what if they don’t? Do political posts persuade or can they risk your relationships? Changing people’s minds is big business. Companies want you to buy their stuff not their competitor’s stuff. States want you to visit them for vacation not someplace else. And of course, political candidates want you to vote for them and not someone else. Attitude change is not always tied to monetary gain. You may want to change a friend’s health behaviors (have them eat more vegetables or cut down on drinking) or even preferences for books or movies (have them watch more science fiction or read mysteries). Not surprisingly, psychological science has been studying ways to change attitudes and behaviors for many years now. Much of what psychological science has learned applies to Potentially Pesky Political Posts (PPPP, say that fast) on Facebook. So do PPPPs on social media change attitudes? First lets look at the frequency of such activity. 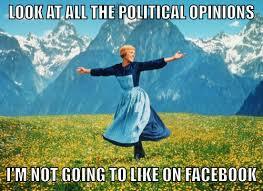 According to a Pew Research Center study, the bulk of Facebook users (86%) see at least some political content, such as posts from friends, news organizations and political leaders. About a fifth (19% of Facebook users), say political posts account for at least half of the posts they see. In another Pew Study, of social media users whose friends post political content, 25% always agree or mostly agree with their friends’ political postings, and 64% agree at least sometimes. Only 9% never agree. When they disagree with others’ posts, 66% of these users say they usually ignore the posts; and 28% said they usually respond with comments or posts of their own. Yes, some do take more serious action. Between 10-18% of social networking site users have blocked, unfriended, or hidden someone. Liberals block or unfriend more often (28%, versus 16% of conservatives and 14% of moderates). But do PPPPs on social media change attitudes? The short answer: Rarely. Here’s why. We live in a social media bubble fostering groupthink. Our friends tend to share our attitudes and beliefs. We are also influenced by their likes and dislikes (See Connected for a great description of Facebook and social contagion). We are drawn to people like us and sift and winnow our networks so people like us surround us. 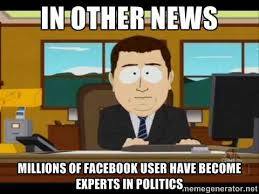 For the most part, our Facebook friends post material and political views we agree with. This is seen in Twitter as well. A recent study showed that Twitter users tend to band together in clusters that share political beliefs. This can lead to groupthink (see Rose, 2011 for a review) where members of a group work towards agreeing sometimes at the expense of critical thinking. There have been experimental studies of the influence of posts (Broockman & Green, 2014). Exposure to political candidates on Facebook increase awareness of the candidates but do not leave to more positive evaluations of them. In a correlation study of Facebook and politics, a key variable seems to be how much one uses Facebook for news (Chan, 2016). The more one relies on it for news (and a lot of folks do), the more it is related to political engagement (posting and liking of political posts) and political engagement but again there is no evidence for Facebook postings changing attitudes. Ignore the comments that irk you. If you comment, keep to the facts and address the argument presented, not the person. Get an assist from technology. A program called Socialfixer helps you filter what you see in Facebook. For relationships that matter, go old school—talk to the person IN PERSON and discuss your differences of option. Grab a cup of coffee. Doing it over a beverage may help (and being in a public place is even better). It is important to remember that social media may not be the best medium to use to convince your friends of the attributes of your candidate or the shortcomings of theirs. The good news is that there is little empirical evidence showing political differences significantly damage close relationships. That said, it is a good rule to be respectful of differences of opinion in general and particularly on social media. Personal attacks of people’s opinions on Facebook can do more harm than good. It may be easy, but the research shows it is not effective or useful. ⟵Can you Read me Now? Should You Trust Your Gut When Reading Others’ Feelings?